One of the conversations I remember having with a classmate around the time of the first moon landing was the classmate telling me how guilty he would feel if he were a pallbearer for Neal Armstrong's casket (as famous as Armstrong is) and he dropped the casket. Noting that Neal Armstrong has passed away I'm remembering that 8th grade conversation. Looking down to cemetery from road up Pilot Butte in Bend, Oregon. See more pictures from Pilot Butte. Also relating this to the trip I am on, I saw one of only 3 caskets I've ever seen in my life on this trip. I've been pretty sheltered from death, but riding to the top of a cinder cone called Pilot Butte in the middle of the city of Bend, Oregon, I looked down on a spectacular view. The whole city spread out before me including a cemetery with a burial taking place. There were the mourners, the hearse and scanning a bit, my eye picked out the coffin looking very tiny from way up on Pilot Butte. 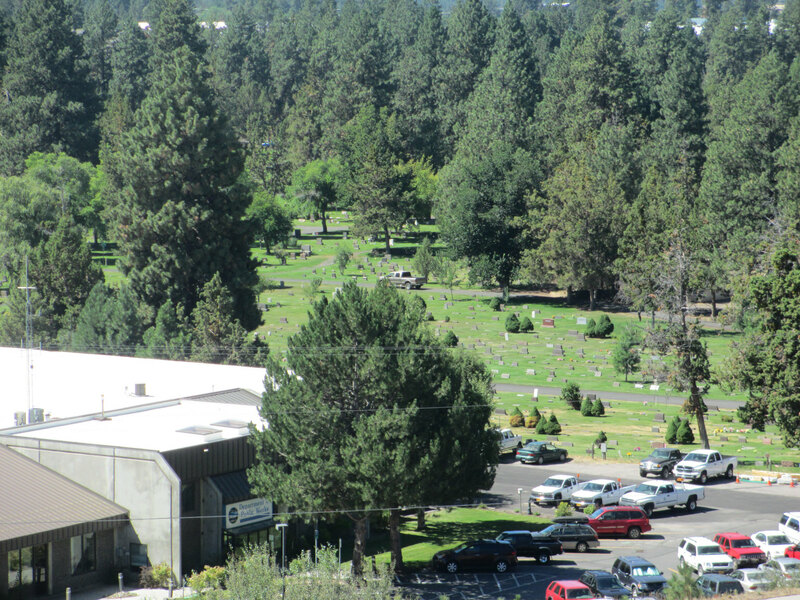 Bend is now around 80,000 population, a bustling retirement and recreation center. The other 2 caskets I've seen were from walking past a funeral home and walking past a church at just the right, or wrong time. All the services I've been to for people I have known have been memorial services without the casket. Also on this trip, I noted another American hero named Armstrong in the news. Lance Armstrong who had the records of his seven wins of Tour de France taken away due to illegal use of enhancing drugs. I speculate that there will be a lot of new winners named for those past races. Radio says the race authorities will have trouble finding new winners as most of the top finishers were also using the illegal drugs. They may have to dig beneath the top ten, for some years, to find legitimate winners who were drug free. I've never been into racing, myself, anyway. Following the science from the moon landing, and current science from the Mars rover is more my speed. Now back to the hot spring to explore more conversation with the many folks who pass through. Then tomorrow (Tuesday) ride down to Eugene. This posted from a cafe in Rainbow, Oregon, up in the beautiful McKenzie River Valley.